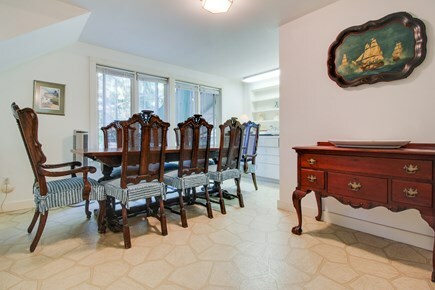 This home is located in the quiet neighborhood of Tisbury. Walk to Lagoon Pond from your house. After a long day at the beach, relax in front of the cable TV. This home is filled with antiques and retro decor. This home is equipped with a full kitchen. After a long day, rest your head in this king size bed. Come home to this king size bed for a good night's rest. The kids will love these twin size bunk beds. Get rested and recharged for the next day in this queen size bed. 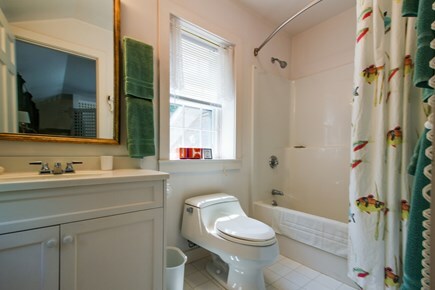 Get washed and ready for the day in this bathroom. 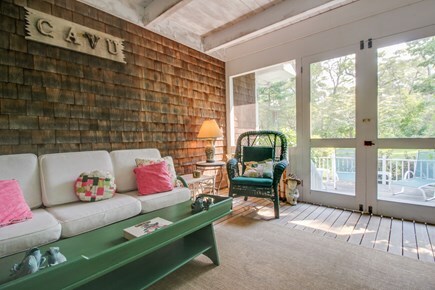 The sky is the limit in this upscale Martha's Vineyard vacation rental. With a large lawn and spacious accommodations, this beautiful estate is luxurious and yet homey, welcoming all for a relaxing East Coast retreat. 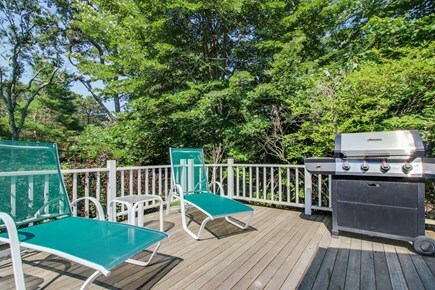 Located in the charming town of Vineyard Haven, and close to the shores of Lagoon Pond, this charming home is close to the action yet tucked away in a quiet residential area filled with families and locals. 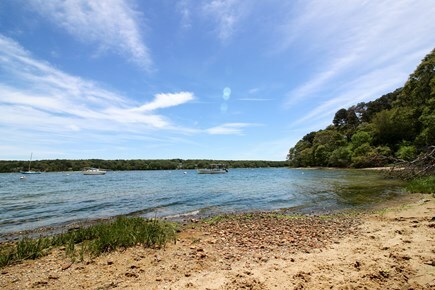 Guests can enjoy a leisurely walk to the shores of Lagoon Pond with a book and a picnic, or launch a water craft off of one of the nearby docks. 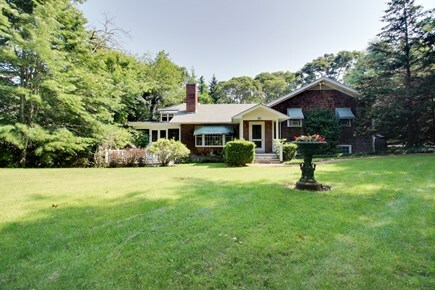 Visitors will be quick to notice the size of this home's stately lawn - a sprawling patch of green ringed by trees with a fountain planter in the center. The house itself is all cottage on the outside with white trim, traditional clapboard siding, and a brick chimney. Once inside, however, you will find a historical home filled with antiques and retro decor filled with the stories and laughter of past generations. Named for the perfect flying conditions - ''ceiling and visibility unlimited'', CAVU - this home is an excellent canvas on which to create your dream vacation. Entertainment is endless in this home. 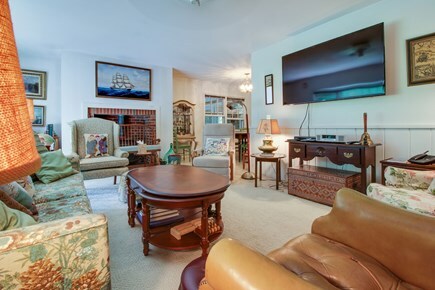 Besides the classic WiFi and cable, this home's electronic fun includes a Blu-ray DVD player, a VCR, a CD player, and plenty of board games to keep the fun going late into the night. Forgot your Kindle or your novel? This home has several libraries scattered throughout the home for you to browse. Don't leave the small guests out! This home comes with a tree house-inspired play loft, where kiddos can play their own board games, put together puzzles, color in coloring books, or read children's books. Kids will love the fun, triangular shape of the room and the ample windows, where kids can watch movies or read in the bean bag chair. Toys and stuffed animals are ready for snuggles, and the curtains can be drawn for afternoon movies. This home has plenty of space to gather as a group with several different sitting areas. The more formal sitting area with period-style furniture is a great place to sip on wine while listening to a CD, or catch the latest sports game on the flatscreen. A more intimate sitting space with homey furniture and a DVD/VCR player creates a more causal setting. 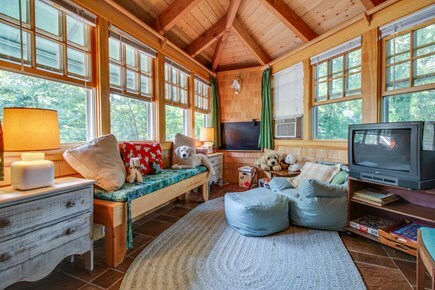 Take reading, board games, or lively conversation out onto the covered sun porch. Enjoy an outdoor affair with a grill and several sun chairs on your own porch, made private by the tall trees and shrubs surrounding the deck. While the adults sip beverages and grill, let the youngsters play a game of kiddie badminton, frisbee, or catch on the lawn. This home comes equipped with a full kitchen done all in white for family-style dining, plus two dining rooms in which to enjoy your meals. 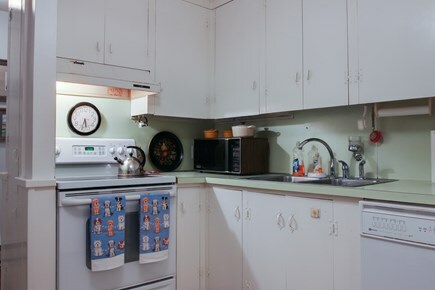 The kitchen is particularly spacious, allowing for many cooks to help each other create a feast, or clean up after it. Extras like a blender, a slow cooker, a mixer, and a dishwasher add to the cooking experience. When darkness falls and it's time for sleep, five bedrooms and five full bathrooms welcome all guests to close their eyes and catch some z's. 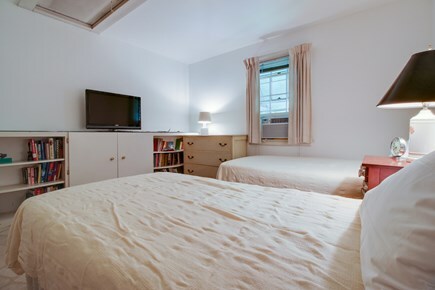 A total of 10 guests (eight adults maximum) will sleep comfortably here, making it a great home for groups of adults or mixed-age groups. 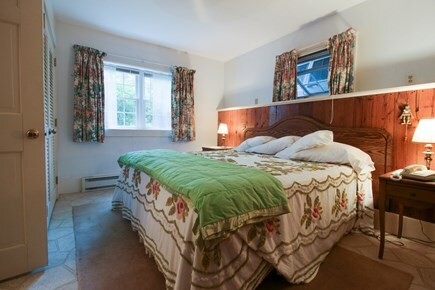 Two bedrooms have king-size beds - one is upstairs and the other on the ground floor. 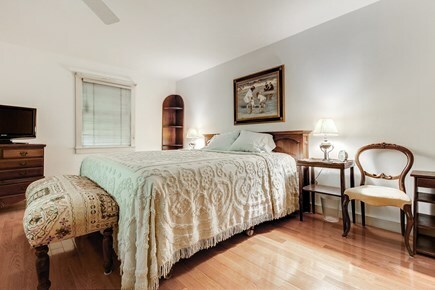 A third bedroom attached to the kids' playroom has a queen bed and a private bathroom, perfect for a couple to share. A fourth bedroom has two single twin beds for older children, and the fifth bedroom has a set of twin bunk beds for your guests. The master wing of this house has brand new hardwood floors! Fun awaits you here in Martha's Vineyard. Start at the shores of the Lagoon Pond with a kayak, a stand up paddle board, or a small sailing boat. Bring your buckets and your clamming gear for a trip to Norton Point Beach, or simply stroll the paths while watching for local birds. Any time of year you can take a sail on the tall ships, though if you're here in August, be sure to check out the wonderful Agricultural Fair. For even more excitement, take the ferry to vibrant, bustling Cape Cod for a day of shopping and dining, or to the sister island of Nantucket. Hike to various lighthouses for a dash of history with your relaxation, or take the kids to visit the Flying Horses Carousel or Oaks Bluffs. 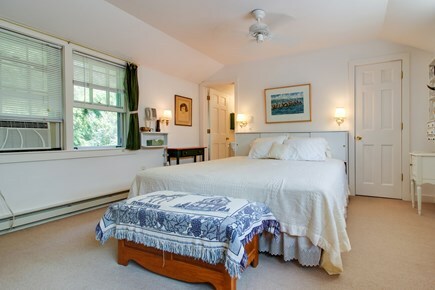 Perfect for a family escapade, this charming Massachusetts vacation rental offers a relaxing backdrop for your fun-filled vacation. Spacious home with enough bathrooms and bedrooms to go around. It’s cozy too!! Great spot/house for more than one family. There were 10 adults and 2 babies. 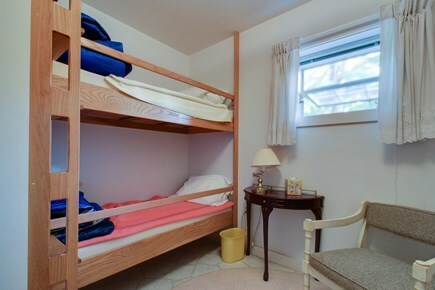 Each family had their own separate sleeping area and bathroom so you could go hide from others or stay and join in the fun depending on your preference at the moment. The screened in porch added lounging area from the living room, which was well used. Setting is quiet and pretty. This was our lodging for an island wedding we were attending. Worked well for us. Located near the weekend wedding activities, it was a great place to stay. Lots of room for everyone. Stayed here for a week with girlfriends. House was spacious and clean. Air conditioning and TV's in good working condition. Would stay here again! House is very nice. Great bedrooms and bathrooms. Perfect for a large family.